Welcome to “11 Questions with…”. This edition’s guest is Roberto Sarjoo. I have known Roberto for a few years. We have very similar work backgrounds, both being in marketing, and the print industry. He is a fairly new parent, with two children under 5 years old. My name is Roberto Sarjoo (@robsarj on Twitter and Instagram). I’m a father of two awesome kids, husband to a wonderful wife, a Franchise marketer by trade, tech geek by interests and life long music lover. 2. Your spouse… tell us about her. My wife and I are a high school love story… sort of. Rachel and I dated back in high school, broke up, went down two different paths and then years later our paths crossed again and we haven’t looked back since. In the early days of the internet, we chatted quite a bit and got to know each other on a very personal, intimate level without ever meeting in person. That translated into us really understanding each other which has made our relationship today what it is. On top of that, she’s such a great mother to our kids, so I pretty much hit the jackpot. My kids are awesome! I have a girl named Amiyana who I have the absolutely best conversations with. I also have a son, Zavier. He’s totally my mini me. Together we break out into dance parties almost daily – from Michael Jackson to the Mother Goose Club and everything in between. Being a new family, we’re starting now to build our own family traditions. One that we currently have is the day before I leave on any business trip, we go out for dinner to a new restaurant we’ve never tried or one our our favourites, Union Social. Being a good parent and being there for my kids are some of the biggest challenges. They don’t know anything and they’re learning something new every day. How can I positively affect their growth, keep them happy, learn and engage with them. I’m helping to mold two human beings into adults, and I have a responsibility to give them every opportunity to be the best they can be. Every day brings its new challenges, but it’s about learning, adapting and growing with them. I love helping people achieve their goals. That’s why I enjoy my current role right now, but it would be to be a business coach or marketing consultant. It would be a role that would give me the flexibility to travel, work remotely from anywhere, and of course, be with my family. If that didn’t work out, it would definitely be a radio/tv host. I love speaking and engaging with people, but there would have to be an element of music involved. Growing up wasn’t straight forward. Our family went through a lot, both when we were together and apart. Between my fathers urge to stay positive and push through anything, and my mothers modern way of thinking (from a culture where the previous generation can be very old school and cultural in their thinking and upbringing, this was huge); the blend of both really inspired me to be the best that I can for me and for my kids as well. Work/life balance is so important – it can drive you crazy if you lean one way or the other too much. I travel a bit for work, so I’m away from home a few days almost every month. When I am home, it’s important that they get my 100% full attention. That means put away the laptop, cell phone and any other thing that would be deemed a distraction. Not going to lie though, we do have YouTube parties, so we bring out the iPhones or iPads. You don’t have to know everything and you’ll never be prepared. Trust in yourself and you’ll figure it out. The spice of advice really resonated with me. Raise YOUR family, not the family that everyone thinks you should raise by telling you what to say or do or how to raise your child. A lot of people will have a lot of things to say about how to raise your child and will offer solutions for problems you may or may not have. Listen; take it all in, but take it with a grain a salt. Each child is different. Each family is different. Apply what works for you and your new family. 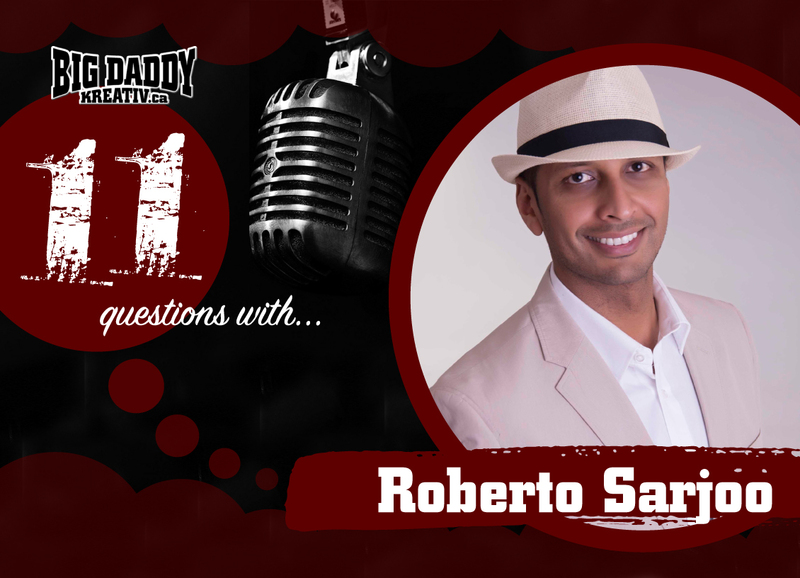 Get social with Roberto Sarjoo! Be sure to follow Roberto Sarjoo on Twitter and Instagram.